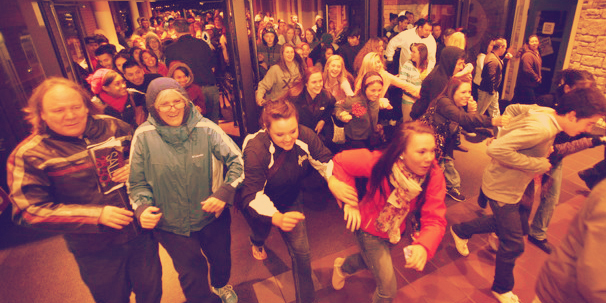 “Black Friday is a double-edged sword for most digital marketers. We know consumer engagement is going to be unusually high so it’s an ideal time to try and capture their attention, but we also know that all marketers are having the very same thought, so it can be difficult to stand out in such a crowded space." Especially for shoppers active on social media and following multiple brands and retailers, constant streams of Tweets and posts about the “best deals” created more noise in an already cluttered environment. The downfall of most retailers during this time is that they’re still treating social as just another touchpoint, relying on the same content they are pushing in already established vehicles – messages about price deals, sweepstakes, bundled offers and special coupons. Sure, deals are an important, if not the most important part of Black Friday, and serve as easy content to drive traffic and sales. But there’s a more meaningful connection to be made. And social media, an already established place for shoppers to connect and become inspired, should have been and can always be a ripe opportunity to do so. While it’s too early to tell who was a real winner in sales, we can learn from brands that connected with shoppers in the #blackfriday conversation in a more emotional way. 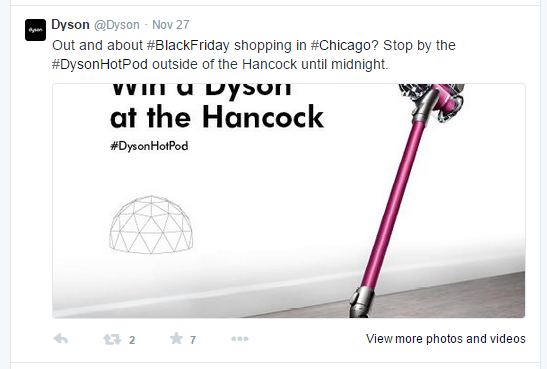 This year, Dyson had a Black Friday sale at major retailers, but also created “outdoor pods” in Chicago featuring its AM05 Heater, where shoppers could stay warm while waiting to get into stores, thereby making their product the hero by rescuing shoppers from the cold – while demonstrating their product’s strengths. They promoted this experience to shoppers in line regularly throughout the night on Twitter. Walgreens created a socially driven campaign called “7 resolutions for real life.” The campaign promoted seven beauty and healthcare products to help start the New Year off on the right track. 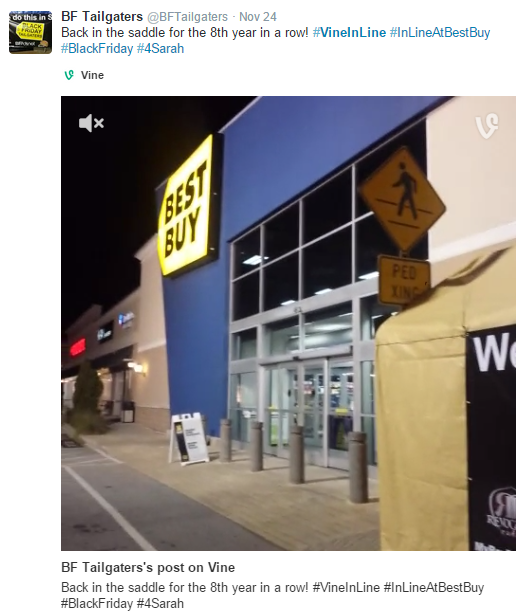 Best Buy did a campaign last year called #VineinLine, a “Better Way to Black Friday.” The idea was for shoppers to capture their experience standing in line waiting on the store to open, in an effort for shoppers to share the chaos. 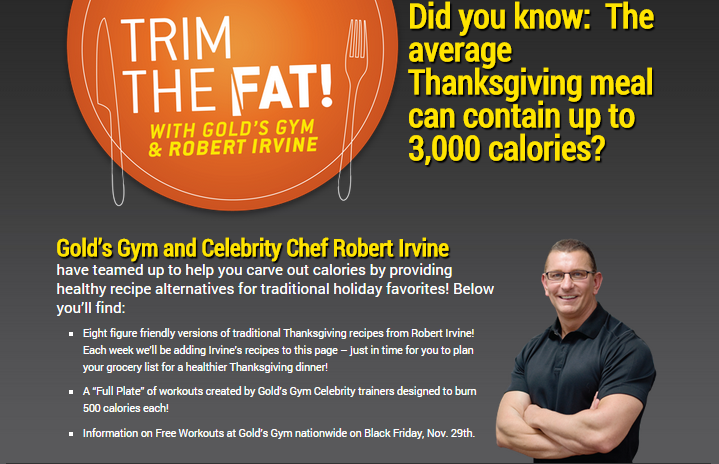 This was an easy way to make Best Buy stand out, keep shoppers engaged and relieve some boredom. Lowe’s also recognized the simplicity and directness of Vine that helps them cut through the clutter. They produced short-form video ads as part of the “Fix in Six” campaign, offering a quick, simple answer to a problem (including generous deals on Lowe’s merchandise). Best Buy knows that social is providing an unsolicited recommendation engine for products, so they leveraged a new technology to display to shoppers, both online and in-store, the products that are garnering the most buzz on Twitter. 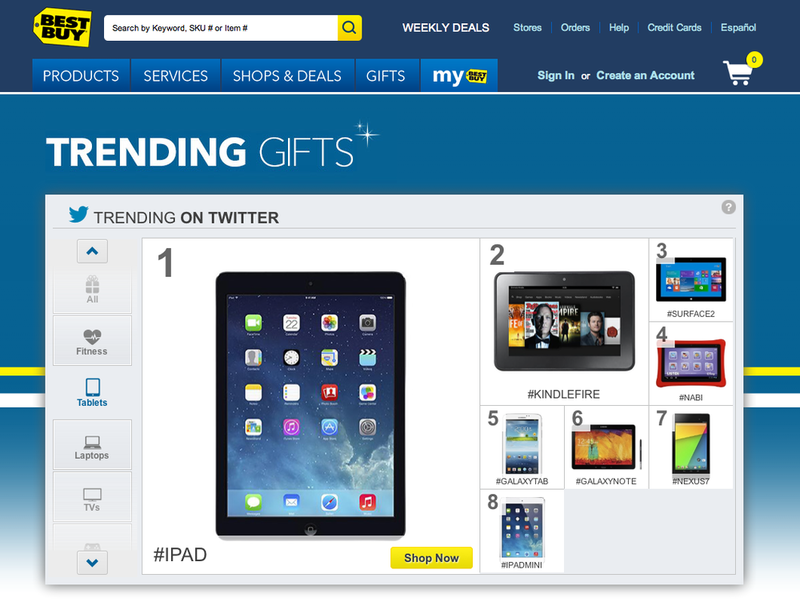 Their social platform, bestbuy.com/trending aggregates this content, including the top shopping-related Tweets. Original ideas paired with a social platform are a great way to reinforce the inherent strengths and identity of your brand, and will help broaden the shopper’s perception from a retail destination with deals and discounts to an environment of unique engagement, value and experience.